These eccentric reducing sockets are used for the connection of two pieces of male threaded pipe of different dimensions. MLB IRN GF Reducing Socket Galv. 3/4" x 1/2"
MLB IRN GF Reducing Socket Galv. 1" x 1/2"
MLB IRN GF Reducing Socket Galv. 1" x 3/4"
MLB IRN GF Reducing Socket Galv. 1 1/4" x 1/2"
MLB IRN GF Reducing Socket Galv. 1 1/4" x 3/4"
MLB IRN GF Reducing Socket Galv. 1 1/4" x 1"
MLB IRN GF Reducing Socket Galv. 1 1/2" x 1"
MLB IRN GF Reducing Socket Galv. 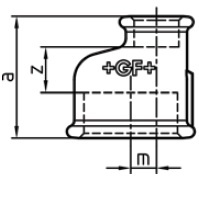 1 1/2" x 1 1/4"
MLB IRN GF Reducing Socket Galv. 2" x 1/2"
MLB IRN GF Reducing Socket Galv. 2" x 1"
MLB IRN GF Reducing Socket Galv. 2" x 1 1/4"
MLB IRN GF Reducing Socket Galv. 2" x 1 1/2"